As I’m sure you are probably aware, my presence in the blogsphere has been rather minimal lately. On many occassions in the last few weeks I’ve felt very uninspired and had nothing exciting to post. I’m sure you can relate to this. I’ve seen so many bloggers says similar so it seems almost inevitable that these feelings will at some point be experienced. Also, my obsession with knitting has basically taken over my life! Every time I’m in the house (or even out of the house, on occassion), I reach for my knitting over anything else including the computer and university work. This has actually become quite a problem; it is just so addictive. I’ve loved knitting for awhile now but this year I’ve taken it to a new level. I’m working on a few different projects and I am trying to knit my first jumper. It is taking forever! Anyway, I should be blogging more frequently now. I’ve missed you all. 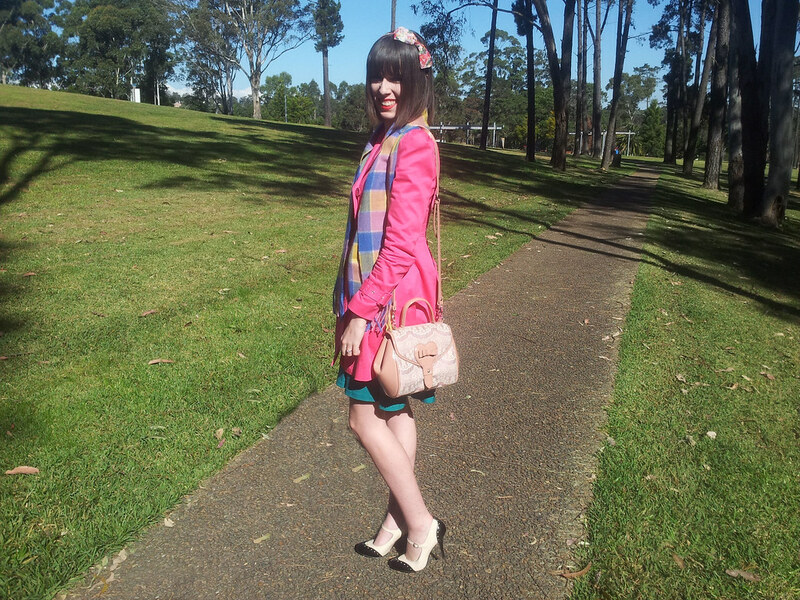 The combination of a large floral hair bow, pink coat, high heels and an Alannah Hill handbag makes me feel like the ultimate girly girl; this totally reflects my style. This headband is one of my favourite items that I own at the moment. I love it and it’s reasonably comfortable too. I’ve been wearing it often. The same applies to my skirt. I adore the shape and it is so versatile; definitely a winter staple for me this year. I also ordered this skirt online in black today so I’m very much looking forward to that arriving. I’ve been in need of a decent black skirt for a long time now. The blouse is one of my latest purchases and most worn items right now. I believe it’s a little more unique that what is generally found in the stores around here. The print is actually little spades, in case you can’t tell that from the photos. The best part, in my opinion, is without a doubt the peter pan collar. I wish more clothes had peter pan collars. How have you all been recently and during my absence from the blog world? Not much is happening with me except for the standard; university, work, wedding preparations, knitting and watching the crime channel. We sent out the save the dates for the wedding this week (since we are having an out of Sydney wedding) which makes me realise how close and real this actually is. I mean, it must be fairly official if people have received their invites, right? This has caused me to experience a wide range of emotions recently. Of course it is very exciting, but it has also reminded me to try and enjoy the final months of being a student, living with parents and not working full time. Maybe all those aspects of my life that I complained about for many years were not so bad after all. There is definitely a lot to look forward to in the future but it just made me realise that there are good and bad aspects of both situations. I’m so happy about the absence of rain in Sydney this May! 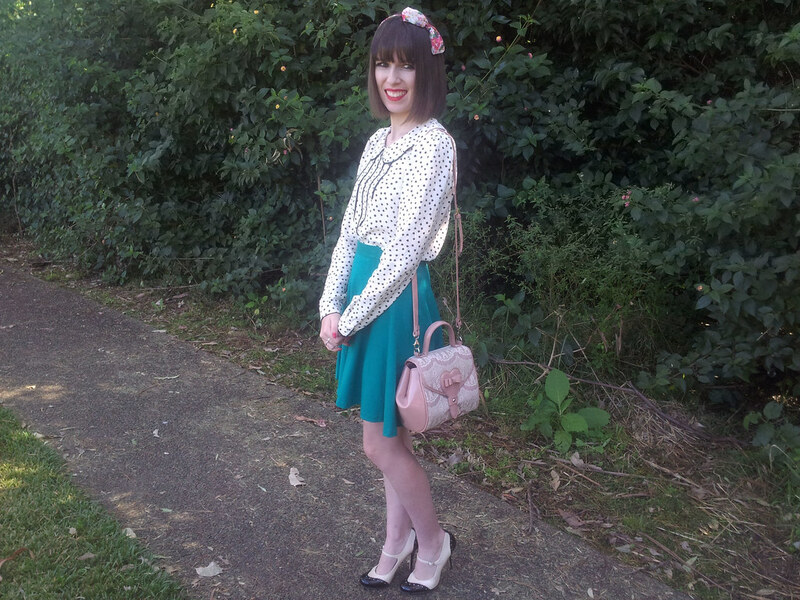 This entry was posted in Dangerfield, Dotti, Forever New, Outfits, Wittner. Bookmark the permalink. I want this blouse! Sooo sooo cute! Very sweet look and pics, darling! You look beautiful in these photos. I love that blouse. Love the colors of teal and pink with black and white. 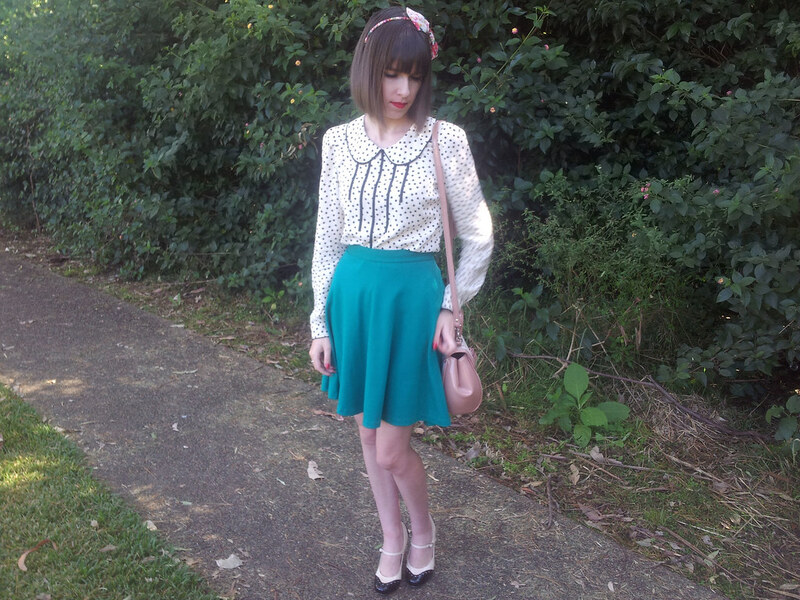 I love this outfit, it is so feminine and stylish and just a little bit 1950's. Hope you're feeling more inspired. We've all been in that position. I love your outfit. The green skirt is so pretty, and I also love the floral headband. Keep us posted with your wedding preparations! Welcome back! I am totally in love with that blouse, I want one too!! I love the girly girl look . 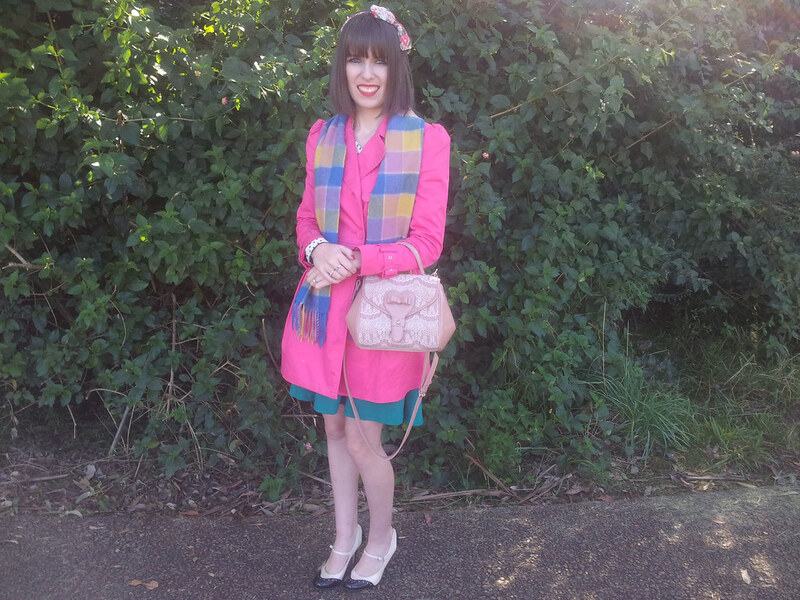 The headband hair bow, pink coat, and pretty blouse with peter pan collar are adorable. because she decided it was too girly for a boy to be doing. It took her ages but she knitted me jumpers throughout my youth. 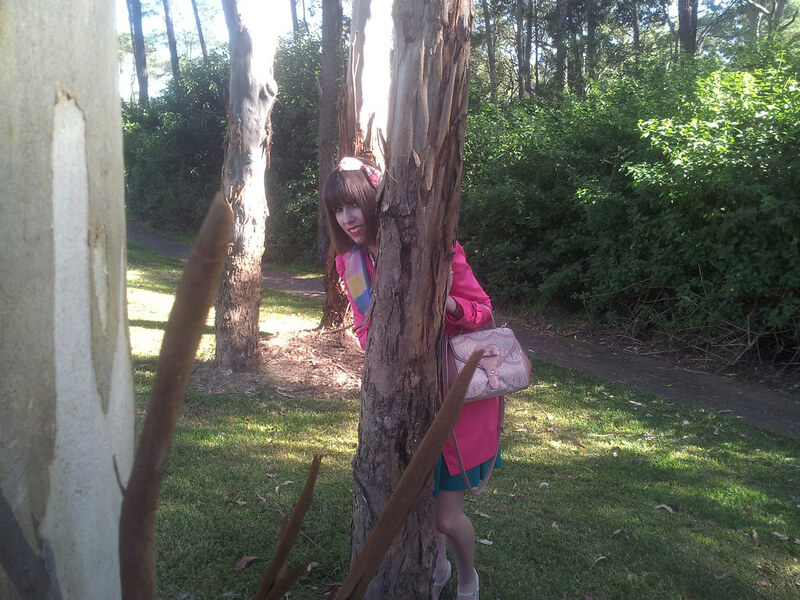 You look young and playful peeking out from behind the tree. It's hard to believe your wedding day is approaching so fast! Time really flies. considering getting married in and almost two years since you blogged the news that you were engaged. I suspect as your wedding day gets closer you won't have much time for blogging, but I'm sure any photos you eventually post will be lovely. Here's hoping your wedding will be a very happy and beautiful occasion and memory for you. Love your polka dot shirt. 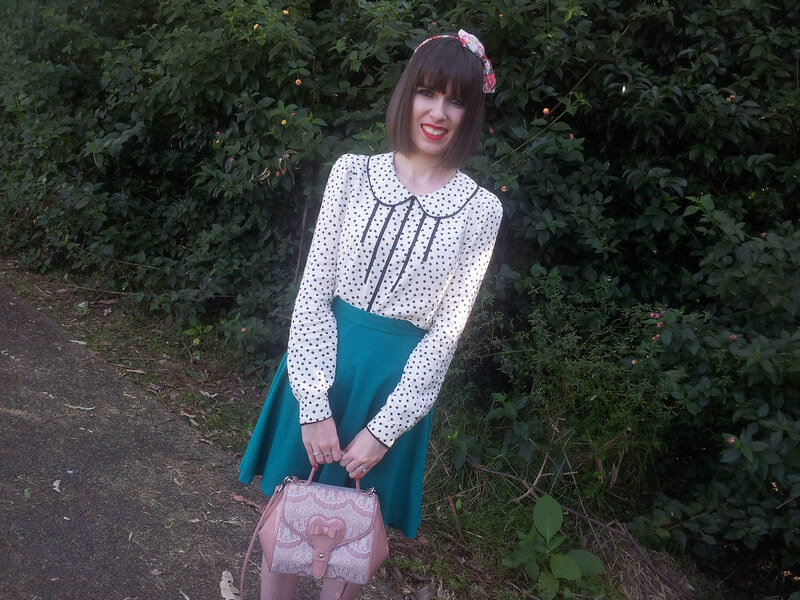 This outfit is so wonderfully girly! 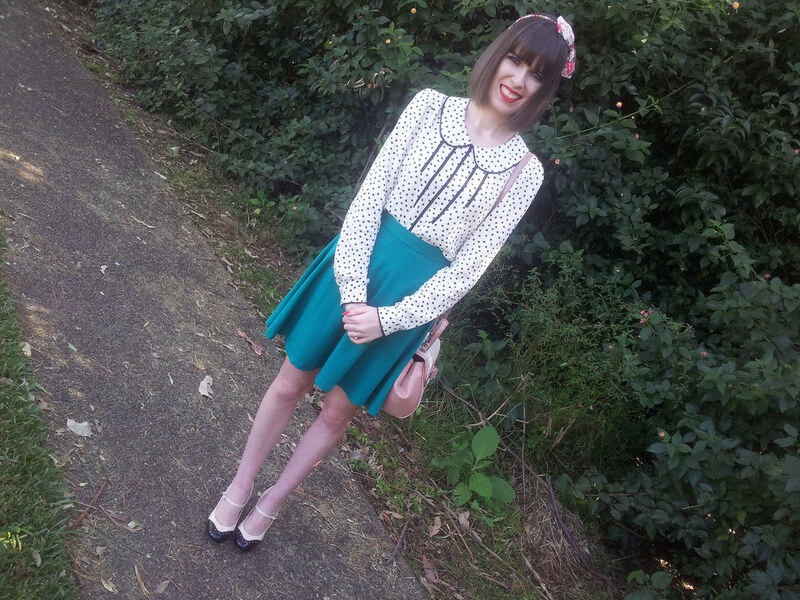 I'm in love with your blouse with the peter pan collar. The color of your skirt is perfect too. And everything pairs so nicely with your pink coat too! I hope all of your wedding planning and preparation goes smoothly! I can't wait to see the pictures and congratulations! omg this is such a cute outfit! i love your style! Lovely outfit! How exciting that you sent out your Save The Dates :D.
Oh I love this look, the blouse is beautiful! I can't wait to see some of your knitting projects! The blouse is adorable! What's it made out of? this outfit is so fun. well done!